This is a sticky post, please scroll down for my newer posts, thank you. I have had a few ups and downs this year, but the ups have been amazing. I was lucky enough to go to CHA in July and met some wonderful and amazing friends. I am lucky to be part of amazing design teams. I visited LOTV for an open day, and there are plenty of things already in the offing for 2014. I have also recently hit a milestone for me, I now have over 1000 followers, for that I can only thank you, I know I've said it before, but I really am grateful to each and everyone of you. I have also had some blushes, two of which are being referred to as THE Becky Hetherington, and having my style of card making as 'Becky-esque', lol. All you have to do is display this picture on your sidebar, with a link back to this post. Pop your name in the linky below, you don't need a blog, just leave that bit blank, and become a follower. The candy finishes on 31st January, so pop back after then and see if you have been lucky. Please no candy only blogs. Congratulations on reaching more than 1000 followers, your work is amazing and so inspirational. Thanks for the chance to win. Hope your New Year continues to bring good luck, health and happiness. Woohoo - that's some awesome candy! Congrats to you for all your successes and on reaching 1000 followers - awesome! I know I don't comment much but I love looking at your beautiful creations. Wishing you a Happy New Year and all the best in 2014! Good luck for 2014 and congratulations. Your work is amazing. Congrats on the 1000 followers! That is so awesome! I will be happy when I reach 50! I love all your creations. So inspiring. Wowwwww, awesome! Happy New Year Becky!!! Happy New Year. Looking forward to seeing your gorgeous 2014 creations. Wiching you all a Happy New Year. Hi Becky, that's a amazing candy! Congrats on reaching more than 1000 followers. I can only dream about that. I love your work and it's so inspirational for me. Hope 2014 brings you all the luck you need and also a healthy and a very creative year. Hugs Carla. As first a Happy New Year to you and your family. Congrats on your 1000 followers. Always look with great pleasure to your blog.To the beautiful cards you every time make. Greetings from Netherlands Margo. Thank you so much for you chance to win! And congratulations to al your succes in 2013. I with you a wonderful, happy and creative year 2014. 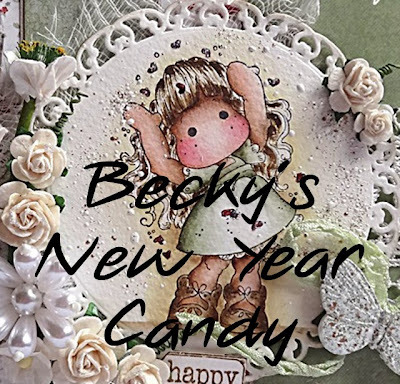 Happy New Year, Becky! Congrats on your achievements in 2013 and best wishes for 2014! I love visiting your blog! Thanks for the chance at your fab new year candy! Your works are amazing - congratz on the followers! Congratulations on reaching more than 1000 followers. I am not surprised you have so many followers Becky, your cards are always so fabulous. Thank you for the chance to win your candy. I'm sure the future will bring you lots and lots of great things!! Congrats! And thank you for the beautiful candy. Congrats on the followers your cards are amazing & a great inspiration for me. Happy new year & i look forward to all your fab cards in 2014. Thanks for this awesome chance to win this fab price of £20. Such a kind gesture of you. Seriously though, it's true, because people immediately know what you mean! Thank you for the chance to win this amazing prize!! Happy New Year Becky! Your card is so lovely. I like the embossing! Thank you for the chance to win awesome candy!!! I know what you mean by the Becky style, your cards stand out a mile with all their gorgeousness. LOVE them and always adore seeing your inspiration. Thanks so much for the chance to win some candy, and congrats on all your followers, although I'm not surprised. Thank you for the chance to win awesome candy! Ik ben net volger geworden van je blog.Je maakt schitterende creaties die ik niet graag wil missen. Thank You for being such an awesome crafter and sharing with all of us. Embrace the ups that will put the downs away. 1000 followers are not that amazing; your work is!! I love really your style and coloring. Every peace is a little art work and I hope to see many more. Thank you for this amazing gift and even so for this candy. I wish you many many more ups for this year and in the meantime I'm looking forward to your new creation. Becky, Thank you for the wonderful candy your offering. I am kind of new to blogging and my new years resolution is to have a successful blog displaying my art work. I am having problems with linking this page to my blog though. It keeps bringing me back to the Totally Tilda Challenge #88 page instead of your page here. If you can lend any assistance please let me know. Thank You!!! Wow...more than 1000 Followers! Congrats! Hope 2014 will be a great year for you and thanks for offering this special Candy! A CHA LDRS Izzys Stroll Wall Hanger.